December 11 2018, Mumbai: Indus Health Plus, the pioneer in the preventive healthcare sector, launched a revolutionary next-generation preventive healthcare service, DNAwise. 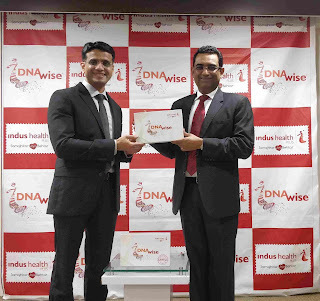 DNAwise is a personal genetic test that decodes the genetic makeup and generates a report through which one can understand the health risks & personalize diet and fitness according to what suits them the best. “With the launch of DNAwise, we are advancing our mission to make healthcare accessible, available and affordable. At Indus, we believe that the culture of prevention and healthy wellbeing should start at an early age” added Mr Naikawadi. DNAwise is a salvia based user-friendly genetic test which can be done from the comfort of home. The reporting and testing involves cutting edge technology and international standards. DNAwise is designed for all age groups and has 60 parameters related to Health, Nutrition and Fitness. The package is available pan India, at INR 14,999+GST and includes saliva sample kit, report and counseling by a qualified genetic counselor. A successful pilot project of DNAwise genetic test was conducted recently across 17 Indian cities. It was accepted very well amongst the consumers and they are now taking it for their family members. We have received a feedback that the report and recommendations are empowering them to live a happy and healthy life. Many are also taking the report to their doctors, fitness trainers and dieticians for more benefits and help in lifestyle personalization. DNAwise is once-in-a-lifetime investment for health that is recommended for all family members to know the predisposition of diseases, followed by yearly health examination. The genetic test report can be the guide for one’s lifelong wellness.